Italy-based DesLabs launched a new product called WiNEOLED - which is an OLED lamp dedicated for wine professionals and amateurs. The idea is that the excellent lighting properties and the uniformity of the OLED panel will unveil the wine's properties like never before. 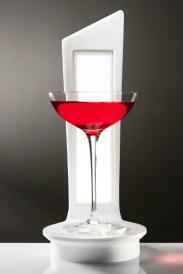 The WiNEOLED uses an LG Display panel that offer a CCT of 4000K, an efficacy of 55 lm/W and a brightness of 75 lumens. The CRI is over 90 and the lifetime is 30,000 hours (LT70). The lamp can be powered with a USB cable, a battery or via a wireless Qi charging based.